Scott Ertl wants to turn students into fit readers. So, if you have an exercise bike serving primarily as a clothes rack, Ertl would like to have it. Ertl, the guidance counselor at Ward Elementary School, and others at the school are starting a program called "Read and Ride." The idea is for a teacher to bring a class of students into a room set aside for the program, give each student an educational magazine, such as Highlights, put the student on an exercise bike, and let him or her pedal and read for 10 to 15 minutes. "We need to get kids more active at school," Ertl said. 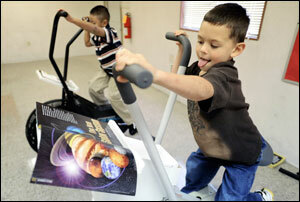 "The goal is to give kids a way to burn off some extra energy." It's also a way to build enthusiasm about reading, he said. bikes -- 30 is the goal -- to handle an entire class at once. People can deliver the bikes if they like, or give the school a call and someone will come pick them up. Ertl is also hoping that people will donate lots of educational magazines, such as Highlights, Boys' Life, Girls' Life, National Geographic Kids and Time for Kids. "We're at the beginning stages," he said. "I'm going to do whatever I can to make it work." As far as Ertl knows, this is the first time such a program has been tried at a school. "I did a Google search," he said. Ward is on Fraternity Church Road in the southwestern part of Forsyth County. To make arrangements to donate a stationary bike or magazines, call the school's counseling office at 774-4674. ■ Kim Underwood can be reached at 727-7389 or at kunderwood@wsjournal.com.